Hope that someone can share their experience with some of the latest emerging backbone.js variants out there. I have some good experience with backbone/underscore/require in several projects and I will like to take the next step towards more advanced solutions for complex application structure. And probably I missed a few. but it's very general. I was wondering if someone can share their experience with real life applications using these frameworks. What is the benefit of choosing one over the other? When will marionette be a better solution over chaplin, or why is vetebrae better for certain applications, for example. Sure, the obvious answer will be "use whats best for your needs", but I lack of the experience with these frameworks to know their strength/purpose/advantages or preferred scenarios. In short, the current structure is close to version 1.0 since it’s already used in production. We’re not planning to add big new feature or breaking API changes until 1.0. Marionette is for sure the most comprehensive and stable library out there. It addresses several aspects of JS app development with Backbone. For example, it has a strong view layer which Backbone itself leaves completely void. Of course, you will find that some of the aspects won’t meet your demands and you might feel the need to set up a structure around Marionette. In contrast, Chaplin focusses on a rather small, but very important aspect of Backbone apps, namely the overall app structure and module lifecycle. In this regard Chaplin is very opionated and is more like a framework than a library (like in “your code calls a library, a framework calls your code”). Chaplin provides some central classes which sit above individual application modules and control the overall app state. This gives your app a conventional structure like Ruby on Rails does it for example. In Chaplin, you declare some routes which map to controllers, and Chaplin starts the controller once the route match. It also takes care of the disposal of old controllers, and the showing and hiding of main views, which a controller is supposed to create. This is the basic idea, but Chaplin takes care of the ugly details to make this run smoothly. Of course these patterns are not new in the software development world, and Chaplin is not the only library which applies them to Backbone.js apps. Chaplin also provides enhancements for the View layer, for example a highly sophisticated CollectionView, but in total not as much as Marionette with its Regions and Layouts. But it’s relatively easy to write such meta classes using the means Chaplin Views provide. Most of (all of?) the frameworks that you're looking at solve the same problems, but they do it in slightly different ways with slightly different goals. I'm not saying none of the other frameworks have these same goals. But I think Marionette's uniqueness comes from the combination of these goals. I spent more than 5 years working in thick-client, distributed software systems using WinForms and C#. I built apps for desktop, laptop (smart-client), mobile devices and web applications, all sharing a core functional set and working with the same server back-end many times. In this time, I learned the value of modularization and very rapidly moved down a path of composite application design. The basic idea is to "compose" your application's runtime experience and process out of many smaller, individual pieces that don't necessarily know about each other. They register themselves with the overall composite application system and then they communicate through various means of decoupled messages and calls. The same large scale, distributed systems also took advantage of message queuing, enterprise integration patterns (messaging patterns), and service buses to handle the messages. This, more than anything else, had a tremendous influence on my approach to decoupled software development. I began to see single-process, in-memory WinForms applications from this perspective, and soon my server side and web application development took influence from this. This has directly translated itself in to how I look at Backbone application design. I provide an event aggregator in Marionette, for both the high level Application object, and for each module that you create within the application. I think about messages that I can send between my modules: command messages, event messages, and more. I also think about the server side communication as messages with these same patterns. Some of the patterns have made their way in to Marionette already, but some haven't yet. Modularization of code is tremendously important. Creating small, well encapsulated packages that have a singular focus with well defined entry and exit points is a must for any system of any significant size and complexity. Marionette provides modularization directly through it's module definitions. But I also recognize that some people like RequireJS and want to use that. So I provide both a standard build and a RequireJS compatible build. This is one of the core philosophies that I bake in to every part of Marionette that I can: no "all-or-nothing" requirement for use of Marionette. Backbone itself takes a very incremental and modular approach with all of it's building block objects. You are free to choose which ones you want to use, when. I strongly believe in this principle and strive to make sure Marionette works the same way. To that end, the majority of the pieces that I have built in to Marionette are built to stand alone, to work with the core pieces of Backbone, and to work together even better. For example, nearly every Backbone application needs to dynamically show a Backbone view in a particular place on the screen. The apps also need to handle closing old views and cleaning up memory when a new one is put in place. This is where Marionette's Region comes in to play. A region handles the boilerplate code of taking a view, calling render on it, and stuffing the result in to the DOM for you. Then will close that view and clean it up for you, provided your view has a "close" method on it. But you're not required to use Marionette's views in order to use a region. The only requirement is that you are extending from Backbone.View at some point in the object's prototype chain. If you choose to provide a close method, a onShow method, or others, Marionette's Region will call it for you at the right time. Of course, I fully support other people providing packages for their language and framework. I list those packages in the Wiki and hope that people continue to build more packages as they see a need. But that is community support, not direct support from Marionette. In my effort to reduce boilerplate code and provide sensible defaults (which is an idea that I directly "borrowed" from Tim Branyen's LayoutManager), I recognize the need for other developers to use slightly different implementations than I do. I provide rendering based on inline <script> tags for templates, using Underscore.js templating by default. But you can replace this by changing the Renderer and/or TempalteCache objects in Marionette. These two objects provide the core of the rendering capabilities, and there are wiki pages that show how to change this out for specific templating engines and different ways of loading templates. 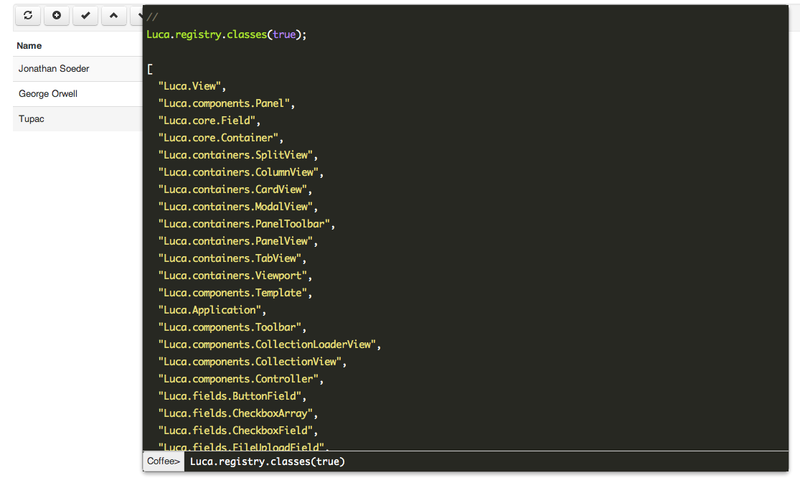 and now the entire application will use pre-compiled templates that you attach to your view's template attribute. I even provide a Marionette.Async add-on with v0.9 that allows you to support asynchronously rendering views. I continuously strive to make it as easy as possible to replace the default behaviors in Marionette. I'm a fan of "convention over configuration" in certain contexts. It is a powerful way of getting things done, and Marionette provides a little bit of this - though not too much, honestly. Many other frameworks - especially LayoutManager - provide more convention over configuration than Marionette does. This is done with purpose and intent. To that end, I take a "code as configuration" approach to Marionette. I don't provide a lot of "configuration" APIs where you can provide an object literal with static values that change a swath of behaviors. Instead, I document the methods that each object has - both through annotated source code and through the actual API documentation - with the intent of telling you how to change Marionette to work the way you want. By providing a clean and clear API for the Marionette objects, I create a situation where replacing the behavior of a specific object or Marionette as a whole is relatively simple and very flexible. I sacrifice the "simple" configuration API calls for the flexibility of providing your own code to make things work in the way that you want. You won't find a "configure" or "options" API in Marionette. But you will find a large number of methods that each serve a very specific purpose, with clean signatures, that make it easy to change how Marionette works. I'm currently using backbone with the layout manager module and handlebars as templating engine and I found really easy to set up a little application using an already existing Grails backend. Before starting using layout manager I read about Marionette and Chaplin and both seemed to me really powerful but complex. Then I remembered why I originally choosed backbone.js: simplicity. All those frameworks are adding what backbone has left out by design. I'm not saying that a framework is bad, but if I need something more complex I'll try other projects, like ember.js or sproutcore, since they have a unique codebase, written with a goal in the mind of their developers. Here we have frameworks on top of another one. Of course, backbone is a backbone not only for building applications, but also for writing some more powerful library, but the only thing I think is really poor with it is the view layer, since is missing a layout manager and the possibility of nesting views. With layout manager that gap is filled quite well. controllers which respond to routes, get/set application state, and hand off work to layout manager. The application manager stores data in memory and also persists data in browser storage to provide a resource for common data/metadata. Also provides data (state) to reconstruct the page views based on previous interactions (e.g. selected tab, applied filters). The application state manager provides a strategy for resources to retrieve state. Meant to act as a state machine. The layout manager has one or many views as well as document (DOM) destinations for each (rendered) view. A page may transition between many views, so the layout manager keeps track of view states, e.g. rendered, not-rendered, displayed, not-displayed. You may use the layout manager to lazy load and render (detached) views that a site visitor is very likely to request, e.g. tab changes on a page. The transition between view states is managed by this object. An entire layout may be cleared so that view objects and their bindings are removed, preparing these objects for garbage collection (preventing memory leaks). The layout manager also communicates view state with controller(s). A controller object is called by a route handler function, and is responsible for getting relevant state (application models) to generate a page (layout), (also responsible for setting state when routes change). The controller passes dependent data (models/collections) and constructed view objects for a requested page to the layout manager. As a side-effect the use of controllers prevents the routes object from becoming bloated and tangled. A route should map to a controller which then kicks off the page view, keeping the route handling functions lean. In summary, Backbone.js is meant to be a tool in your application the Backbone.js library does not provide all the architecture you will need to build an application, but does provide great interactions with an API and solid code structure for... Views (act like controllers too) and your data layer Models and Collections, and finally Routes. We built Vertebrae to meat the goals of our project, and decided to extract the code as a framework for others to use, learn, or whatever. I developed the Luca framework while working at BenchPrep where we used it to develop several large single page apps on top of the backbone.js library. I had worked with ExtJS for several years prior and have stolen my favorite concepts from that framework such as the component driven architecture where you develop your views as standalone components and then join them together with other components using container views. And since it is heavily based on configuration, developing an app in Luca feels a lot like describing an object with JSON. One advantage to this approach is the ability to re-use components across several apps or in different places in your app, with with only minor changes using Backbone's extend. It is also very easy to experiment with many different layouts / presentations of components by making only minor tweaks to the JSON configuration. In addition to a wide range of helper / utility functions, Luca Ships with many higher level Backbone derivatives that you can piece together in any way imagineable to build a complex UI. Configuration options that facilitate communication between Models, Collections, Views, the Application and its respective managers. Luca plays very well with the Twitter bootstrap framework. Simply by setting Luca.enableBootstrap = true, and including the CSS, your components ( such as the tab views, the toolbars, buttons, forms, fields, grids, etc ) will automatically use Twitter Bootstrap compatible markup and CSS class conventions. 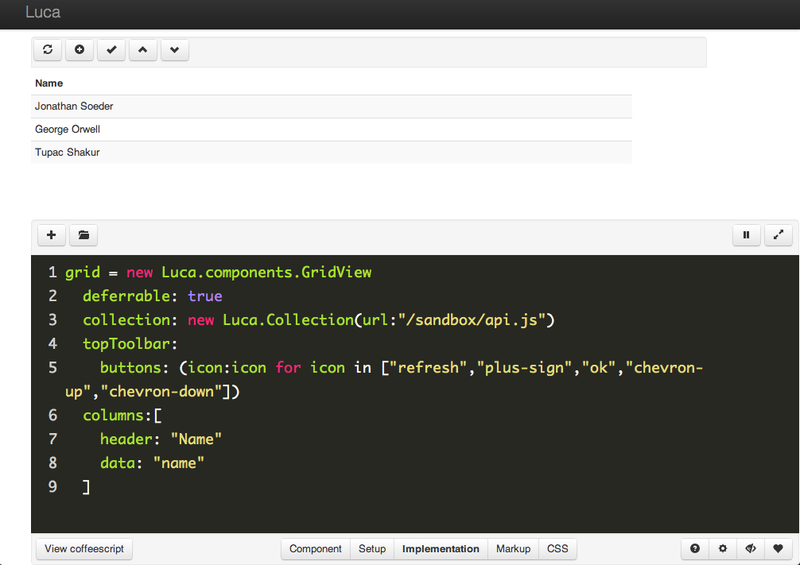 Luca.Viewport and GridLayout components are setup to work with bootstrap's responsive, fluid, or static grid systems. Luca components are more liberal with the events they emit compared to the stock Backbone components. They will emit events like before:initialize, after:initialize, before:render, after:render, activation, first:activation, deactivation, first:deactivation, and this allows you to more finely tune the behavior of your components. Plus, by defining an event in the @hooks porperty on your view, it will automatically call a similarly named function for you if it exists. This prevents a lot of callback style code which improves readability. You can also configure the Luca.Events class to publish the events to a global publish / subscribe channel, which makes building a large application easier and aids in inter module communication. Luca was developed specifically while working against Rails and Sinatra APIs and because of this is currently optimized for a specific stack, but it in no way locks you into a specific server. Luca comes distributed as part of a Ruby Gem configured to work on the asset pipeline, or as a downloadable JS file. A Test Harness for browser, or headless Jasmine based Unit Tests along with many Backbone and Underscore test helpers. With the help of the Rails Gem, and Luca's CodeMirror based component editor, you can edit the source code of the Luca Framework as well the application specific components directly in the browser, using Coffeescript. You will see immediate feedback in response to your edits, with the instances of effected objects being refreshed with the updated prototype, and you can save your changes to disk. The Component Tester is a live sandbox for playing with the components that make up your application in isolation. It provides you with tools for modifying the component's prototype, setting up its dependencies, and configuring the component. The component will re-render immediately every time you make an edit. You can view and edit the markup that the component generates, as well as the CSS directly in the browser and see your changes immediately. This makes it a very valuable experimentation tool. Luca is a work in progress, but maintains a stable API ( not yet 1.0 ) and has been used in several large production apps. It is definitely a very opinionated framework, but I am working on making it more modular. I am actively working on the documentation and sample components. This is not a “shootout” but tries to explain both approaches in a balanced way. What is the purpose of backbone.js? What is the best way to learn backbone.js? Any other alternatives? jQuery Mobile with Marionette or Chaplin?